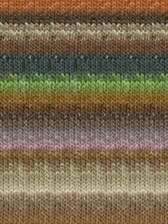 Bring your outfit to life with this stunning open weave, multi-hued scarf in Noro's breathtaking Silk Garden yarn. 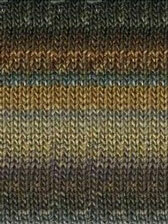 You will also need a pair of 8mm knitting needles, and a wool needle (not included). * Note: our model is wearing 'Cherry Blossom Time' Scarf in Shade 87. 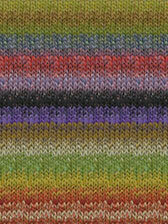 Be swept away by the stunning shade combinations and unparalleled quality of Noro's Silk Garden. Only the highest quality fibres make their way into this blend: lustrous silk merged with kid mohair and lambswool sourced from the youngest animals, to ensure your yarn is the finest quality textured yarn blend imaginable. 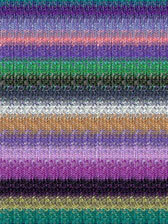 These fibres take up dye superbly, ensuring you get vivid, true colours to tantalize your senses. 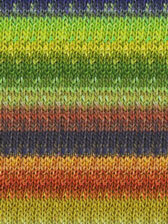 The combination of texture and tone turns every stitch into a rare pleasure. Noro advocate for sustainable production methods, and use traditional manufacturing processes to reduce power and water consumption.